The Coolpix S810c is Nikon's second Android based smart camera. Boasting a 16 megapixel CMOS sensor with EXPEED C2 processor, 12x optical zoom, built-in wifi and LCD touch-screen, it looks beautiful and seems to have all the equipment for taking and sharing pictures on the go. But how will it cope in our rigorous test? Priced at around £280 / $349.95, the S810c is available in black or white. The unassuming exterior of the Nikon Coolpix S810c is a wonderful juxtaposition to the secrets it holds inside. The front is a smooth, glossy face with a slight bulge to house the large 12x optical zoom. The back is equally sparse of features with only three buttons down the right side. If you're unaware of the features that this and the previous model it replaces can do for you, it could take a while to realise that the buttons are similar to those found on a typical Android smart phone. The Nikon Coolpix S810c is touch screen and even incorporates a touch to shoot system where you press the part of the frame you want the camera to focus on and it will do that before automatically taking a picture for you. If you're a current Android user, you'll be familiar with many of the features that the camera supports including access to Google Play (the Android app store). You can download any app including social networking and games. The internet access and built-in WiFi make it easier to upload images straight to the internet with only the lack of a 3G signal limiting it's capability. However, the clever boffins at Nikon have considered that and the S810c can connect to a smart device via WiFi. It will transfer images and video to the device where you can then upload top the internet from there. There's a ridiculous number of features available and as such, we wouldn't be able to cover them all so instead we'll concentrate on the new features and upgrades from the previous S800c model that the S810c replaces. External improvements include the 12x optical zoom from 10x on the S800c. On the back there's an ever so slightly larger screen at 3.7 inches. However, not all of the screen is utilised when taking pictures. It does have black bands down either side which are then used for touch-screen menus. Internally, the memory card has been downsized to the MicroSD card. That may seem like an unusual change to make, but it's perfect for then changing over to a phone and transferring images that way as it saves battery power. The battery has also been upgraded to the new EN-EL23. It can take up to 270 pictures compared to the 140 pictures using the EN-EL12 in the S800c. Shooting settings such as the resolution and ISO sensitivity have remained the same. 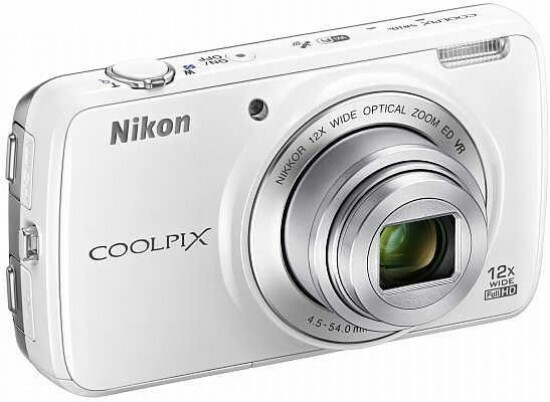 There's a great deal to do on the Nikon Coolpix S810c. Shooting alone has many features available. The left side of the screen has quick option buttons such as flash functions, self-timer and exposure compensation. The right side has the shooting and playback buttons as well as an option for adjusting colour vividness. Within the latter button, you can choose from Vividness or RGB filters. While the Vividness slider changes the saturation of the picture, the RGB setting adjusts the hue of the picture. As well as the typical menu systems available on a normal digital camera, the S810c also has an Android based menu system. It's accessed by pressing the Home button on the right side of the camera. It switches the camera section off and you have to unlock the smart device software by swiping the screen. Once inside you have a window with half a dozen apps pre-installed. As long as you have internet access, you can treat the camera as a smart device from here. Going into the Play Store will allow you to download apps. Because you should have an account with Google to download the apps, if you have an Android based phone or tablet, you can download the apps you already have registered to your account. The camera has 4Gb of internal storage to cope with this. The icons to the right will take you back to shooting or playback depending on which way the camera is facing that you touch. The centre circle with dashes inside it takes you into the rest of the pre-installed apps on the camera. You can drag these onto the main window or leave them where they are, the choice is yours depending on your preferred work-flow. Starting the Nikon Coolpix S810c up and timing how fast it can do it is an unusual event. Starting it up normally can take anything up to five seconds. If you hold the power button down for a moment before switching it off, an option to prepare it for a quick start will pop up. This does cut the time down, but only to around 3.5 secs. That's slow by a long margin and we couldn't cut that time down. We uploaded images to Facebook and were successful. It did take some time, but being out in the countryside while testing, the broadband signal was only around half a meg. There are multiple continuous options. The High speed option takes three seconds in a quarter of a second. The downside to this lightning fast speed is that it takes around 30 sec to download the images. You can opt for the slower setting which plods along at around 2fps (frames per second) for three seconds then stops to download. This again takes around 30 seconds. Once you take a picture, a small thumbnail of the most recent image will be displayed in the bottom right corner. You can tap that picture to be taken into the playback area. You can swipe through pictures using the touch screen. Pressing the menu button gives you the option for deleting, creating a slide-show, protecting pictures and other features. The buttons on the right of the screen allow you to share images via WiFi with an indicator sat above it, an option to go back to shooting and a Timeline View option. With this, you can choose images you wish to view in a vertical scrolling timeline. A little like how Facebook or Instagram now show images in an album. As we mentioned earlier, the Nikon Coolpix S810c takes a rechargeable lithium ion battery. The charger is a simple charging unit that plugs into the mains with USA points or you can use the included UK adapter. We find this very useful for when travelling to countries that use this plug type such as USA, Canada, the Caribbean and the Philippines. The USB cable plugs into this and then directly to the camera. The great news is that you can also use a computer to charge, via the USB. This can take longer, though. There's also a wrist strap and a Quick Start Guide to get your camera ready to shoot. If you want more indepth knowledge, you can download the full manual from the Nikon website.